Roma Trastevere railway station (Italian: Stazione di Roma Trastevere) is a major railway station serving the city and comune of Rome, Italy. Opened in 1911, it forms part of the Pisa-Livorno-Rome, Rome-Capranica-Viterbo and Rome-Fiumicino railways. The station is currently managed by Rete Ferroviaria Italiana (RFI). 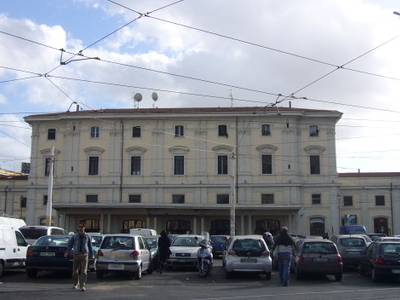 However, the commercial area of the passenger building is managed by Centostazioni. Train services are operated by Trenitalia. Each of these companies is a subsidiary of Ferrovie dello Stato (FS), Italy's state-owned rail company. Roma Trastevere railway station is situated at Piazza Flavio Biondo, southwest of the city centre. It is at the southern end of the Trastevere district, close to the districts of Marconi and Portuense. Roma Trastevere's passenger building was designed by Paolo Bo. It is a large structure made up of several conjoined sections, ranging from two to four storeys in height. The ground floor level of the central section provides various facilities to passengers. The station has six through tracks faced by platforms fitted with shelters and connected by a subway. Operationally, it was previously classified as a junction station, but in 1990 it was downgraded to the status of a stopping point. Today, the Ferrovie regionali del Lazio FR1, FR3 and FR5 commuter lines all pass through the station, which is also planned to be an interchange with the proposed Line D of the Metropolitana di Roma. 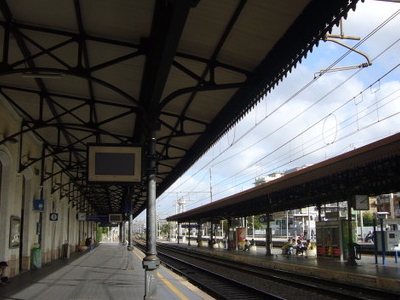 Here's the our members favorite photos of "Railway Stations in Rome". Upload your photo of Roma Trastevere Railway Station!